The Spectacular Second Empire, 1852-1870 exhibition at the Musée d’Orsay, one of the most sensational shows of last season in the City of Lights, celebrated the period that gave birth to so much of what epitomizes French style today. The grand boulevards of Paris were constructed. Ladurée and Louis Vuitton were founded. French fashion and jewelry designers became renowned around the world for their superiority. The exhibition celebrated the sumptuousness of the period that was filled with parties and balls, luxuriously appointed mansions, made-to-measure gowns, and, of course, plenty of jewelry. Thirty-five pieces to be exact. 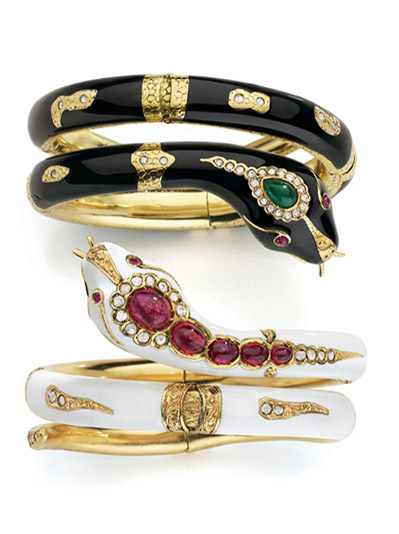 All of it came from one of the most esteemed jeweler’s of period, Mellerio dits Meller. One of the most amazing jewels in the collection belonged to Empress Eugénie, the wife of the Emperor Napoleon III who was the de-facto style icon of the era. She famously changed her clothes and jewelry three or four times a day and rarely wore the same outfit twice. Charles Frederick Worth made her dresses. Louis Vuitton crafted her trunks. Mellerio created many of her jewels. Founded in 1613, Mellerio dits Meller’s client list includes a long list of luminaries including Marie de’ Medici and Marie Antoinette. The house became widely known throughout Europe during the mid 19th century when it participated in the Universal Exhibitions in Paris and London, grand fairs attended by millions. 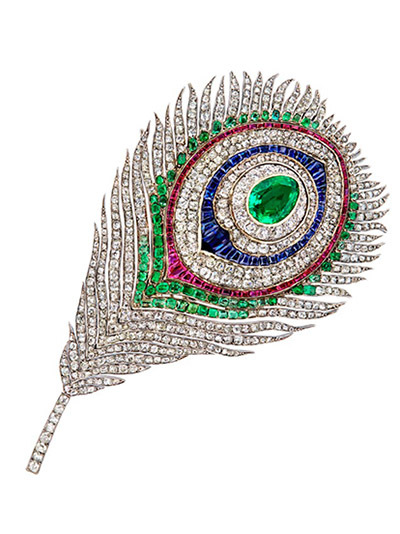 Among the royals who placed orders with the company during the 1867 Universal Exhibition in Paris were the Kings of Italy and Prussia, the Emperor of Russia, the vice-King of Egypt and Empress Eugénie herself, who ordered a brooch in the shape of a peacock feather from Mellerio after seeing the original design at the fair. However, this was far from Empress Eugénie’s first jewel by Mellerio. The Emperor, Empress and their court had purchased jewels from the company for years. Many were on display in the exhibition at the Musée d’Orsay. Princess Mathilde, a cousin of Emperor Napoleon III and celebrated jewelry collector, was a loyal Mellerio customer. She adored the house’s strikingly modern enamel snake bracelets. One of Princess Mathilde’s most extraordinary jewels was a huge rose bodice ornament covered in diamonds (seen in the photo at top). 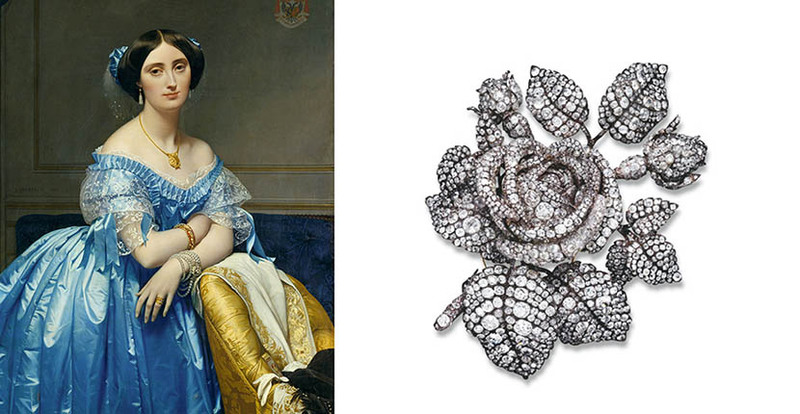 According to historical documents the rose brooch contains an eye popping 2,637 brilliant shape diamonds weighing a total of 136-carats and 860 smaller rose cut diamonds. When the jewel was sold at auction in 1904 after Princess Mathilde’s death it went into the collection of the French jeweler Janesich who sold it to Cartier who sold it to Cornelius Vanderbilt for his wife Grace, the Queen of New York society. The New York connection to the famous French jewel reminded me of a portrait from the Second Empire that hangs at the Metropolitan Museum of Art depicting Princess of Broglie, the wife of a French aristocrat. In the masterpieces by the artist Jean Auguste Dominique Ingres the Princess is wearing several jewels by Mellerio with her bright blue silk dress including strands of pearls wrapped around her wrist and a gold necklace and earrings. It would have fit right in at the Spectacular Second Empire. The exhibition presented an array of royal and aristocratic portraits by the painters Franz Xavier Winterhalter, James Tissot, and Ingres. The art provided a window into the opulence of the era and carefully depicted couture dresses, magnificent jewels and gilded interiors. The only thing missing from these ideal views of Parisian life are those seafoam green boxes of Ladurée macarons.